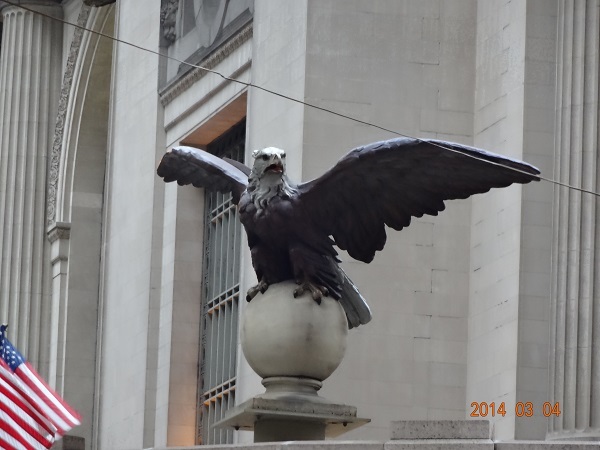 This eagle, like the one at the Philipse Manor train station, is from Grand Central Depot. It is above the entrance to Grand Central Terminal at the corner of Vanderbilt Avenue and 42nd Street. I quickly snapped this picture right before I crossed the street to catch my train home one evening. Unlike the eagle at Philipse Manor, where anyone can walk up to it, this eagle is inaccessible to people, being along the elevated Park Avenue that splits and goes around Grand Central.